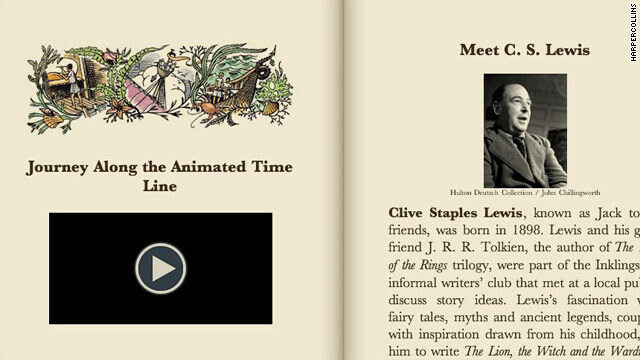 The enhanced e-book for "The Voyage of the Dawn Treader" adds timelines, videos and other nontraditional features. (CNN) -- "The Voyage of the Dawn Treader" is a novel -- part of the classic "Chronicles of Narnia" fantasy series by C.S. Lewis. Next month it will become a movie, the latest in the franchise's big-screen series. And it's also cresting a wave of enhanced electronic books as one of the most high-profile literary works to take advantage of the new abilities of readers such as Apple's iPad and other tablet computers. Released by HarperCollins and available this week for several tablets and smartphones, "Dawn Treader" will include features such as embedded video, read-along audio clips, trivia games and full-color images. It also includes a map of the fantasy land of Narnia (a feature creators say was one of the most requested by fans), a blueprint of the magical sailing ship the "Dawn Treader" and a guide to the creatures and people in the book. Or, in the words of HarperCollins, it "targets multiple senses to create an innovative and exciting way to experience Narnia on e-reading technology." It's certainly not the first book to take advantage of the new features rolling out as electronic-reading technology advances. But by embracing the change in how people read books, Lewis' estate reinforces the trend toward these digital platforms. Watch an animated timeline from the enhanced e-book, "The Voyage of the Dawn Treader." Lewis died in 1963, about a decade after "Dawn Treader" was first published. So what would the author, a friend of "The Lord of the Rings" writer J.R.R. Tolkien, think of the new technology? "That's very hard to answer as [personal] computers were not even invented when Lewis was alive," said Simon Adley, who manages publishing for the Lewis estate. "But I can't think of any reason why he would object to seeing his work available to a new generation of readers." The e-book's creators say that they were turning over electronic treatments for books such as "Dawn Treader" well before technology for devices such the iPad, or Samsung's Galaxy, which was released this week, even existed. "Our wheels started turning two years prior," said Ana Maria Allessi, the e-book's publisher. "Knowing this day had to come, we've been strategic for a while now." In addition to the iPad and Galaxy, not to mention several other tablet computers hoping to rival those two, readers such as the Barnes & Noble Nook are experimenting with color and other features. Simon & Schuster released what it called the first enhanced e-book, Rick Perlstein's "Nixonland," for the iPad in July. It included an interview with the author and historic video clips produced by CBS News. A digital version was also created for the Amazon's Kindle. And popular Japanese author Ryu Murakami may have signaled things to come when he wrote a novel specifically for an enhanced e-book format, skipping his publisher altogether. "This is, we think, just the beginning of what could become an entirely new medium, in which texts are merely one component of a larger multimedia experience," wrote Lauren Indvik for social-media blog Mashable. Regardless, it's clear that traditional publishing houses see the format as a way to reach new readers as well as drawing existing fans back to their old favorites.
" 'The Voyage of the Dawn Treader' enhanced e-book allows us to bring readers of all ages to C.S. Lewis' visionary series in an entirely new way," said Susan Katz, president of HarperCollins' children's book division. "This enhanced e-book has something for everyone, whether you've read the book before or are discovering it for the first time."